Whether it comes as a surprise or is met with an audible “Well, of course”, we want you to know that the CFMCV’s have a mandate to support sustainable living in the Desert. 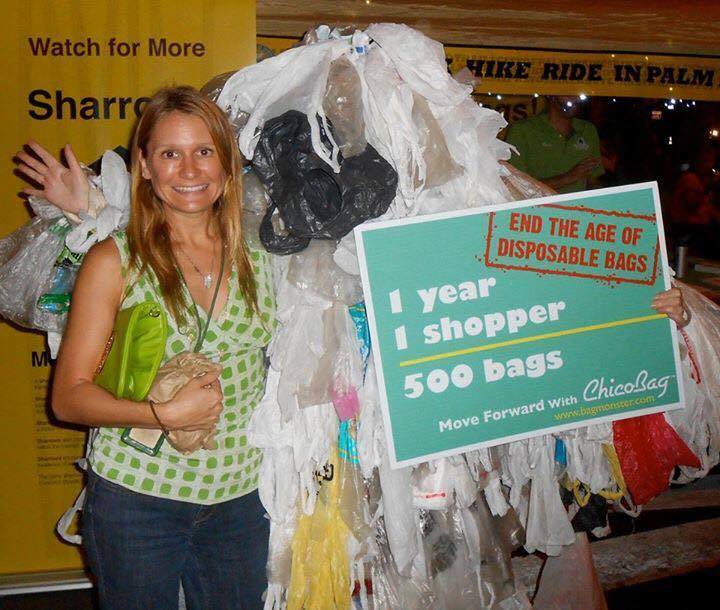 If you’ve been a regular shopper and/or reader of this e-newsletter you know that there is a small category of businesses participating in the Markets who are dedicated to helping folks live more in harmony with the environment and rethink their consumption of material goods. Mike’s Bike Truck reminds our Palm Springs and La Quinta customers with his big orange sign and valet rack that we have the perfect climate in the desert for clean transportation (and he can help them get their flat tires fixed and back on the road!) Leslie Shockley and her Tea With Iris home goods give new life and meaning to used fabric, yard clippings, wine corks and old books. Kellie Pellegrini is taking her Upcycle Craftworks shop in a new direction, transforming it into a non-profit organization that helps veterans dealing with PTSD focus on creating beauty and purpose from discarded glass, metal and rocks. In April we’ll welcome David Garcia’s My E-Waste Drop Off and connect the CV with someone doing his part to handle obsolete electronics in a safe and sustainable way. Beyond these current/former/future vendors, we’ve long partnered with the city of Palm Springs Sustainability Commission to offer FREE Sustainable Saturday Film Series at the Camelot Theatres concurrently with our Palm Springs Market. These documentaries often slip through the cracks in a crowded entertainment landscape but offer a perspective on topics that help us view our world from new and important angles. Whether they peek behind the scenes into small farm operations, ponder climate change or discuss downsizing our consumption, the Sustainable Film Series capture these concepts and give a stage to people doing their part to challenge the status quo. In a little less than 2 weeks we’ll be offering our latest FREE Sustainable Saturday Film, called “Within Reach”. The documentary explores one couple’s pedal-powered search for a place to call home. Mandy and Ryan gave up their jobs, cars, and traditional houses to ‘bike-pack’ 6500 miles around the USA seeking sustainable community. Rather than looking for a traditional neighborhood, they begin to recognize that the personal connections within a place are the secret ingredient to living sustainably on this planet. Along the way, they explored 100 ecovillages, cohousing communities, co-op houses, communes, transition towns, and their own principles and commitment. In the end they return to the timeless truth that community is people; they are everywhere; and there is room for everyone. Our screening will be shown at 9:00 a.m. in Theatre #3 of the Palm Springs Cultural Center, and will be followed by a phone conference Q & A with the filmmaker, Amanda Kay. So far, pretty good, but this Sustainable day gets even better. Because we are taking this opportunity to memorialize the life of someone who truly inspired us at the CFMCV’s with a community bike ride. Michele Mician managed the PS Office of Sustainability from ( to ) and during that time she brought a kinetic energy to projects all around our town, due to her tireless enthusiasm and prodigious grant writing ability. EV Charging stations? Michele’s project. Bicycle-shaped bike racks? Also Michele. Newly painted street sharrows, the Mayor’s Race, many of the trees replaced during the last major windstorm, homeowner incentives for drought-tolerant landscaping, the PS plastic shopping bag ban? Every project has her indelible fingerprints. Plus, she was a dedicated Market shopper and SSFS supporter. So it seems fitting that before we show the first SSFS movie of 2018 we should take a family-friendly spin around the city that she loved. The 6.5 km rectangular route begins in front of the Palm Springs Cultural Center at 8:05 a.m. and spots that she had a hand in will be marked along the way. Mike’s Bike Truck will be on hand to keep an eye on the bikes of folks who want to do the community ride and see the movie as well. Finally, even if you can’t make time for the ride or the movie, you can make a difference on 3/31 in a sustainable and community-building way. 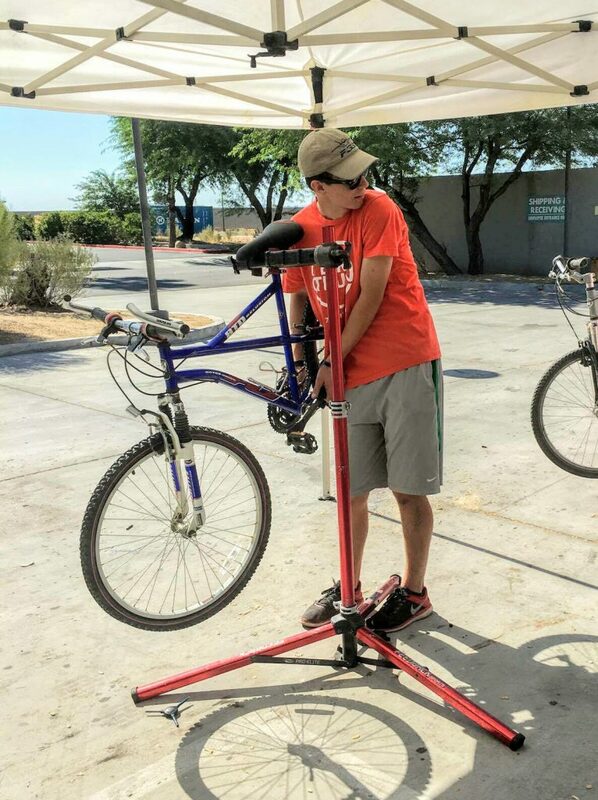 Ben Goehring, Palm Springs High School senior, is working towards his Boy Scout Eagle Award by collecting unused bicycles and rehabilitating them for donation to Well In The Desert, to help folks who need transportation get around town more easily. Dig out that old bike blocking your goal of a more minimalistic lifestyle and leave it at Mike’s Bike Truck for Ben to pick up!